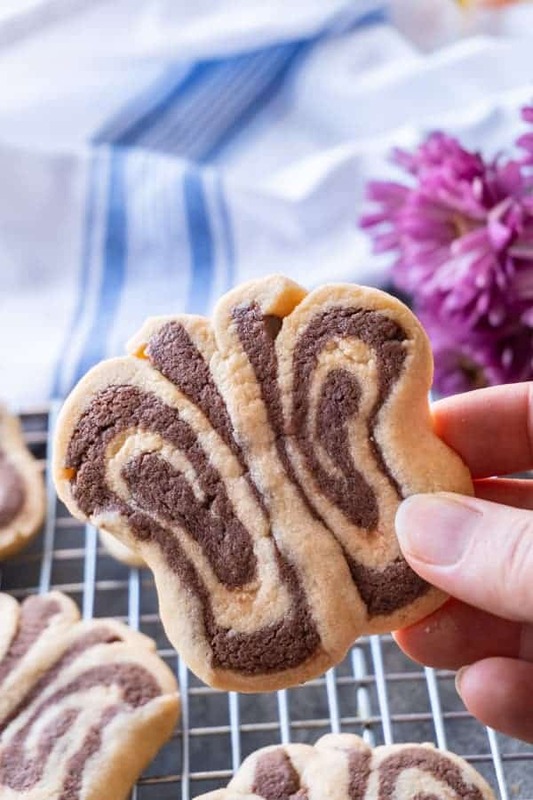 Butterfly Cookies -These tasty peanut butter and chocolate sugar cookies are fun to make and great for Spring! 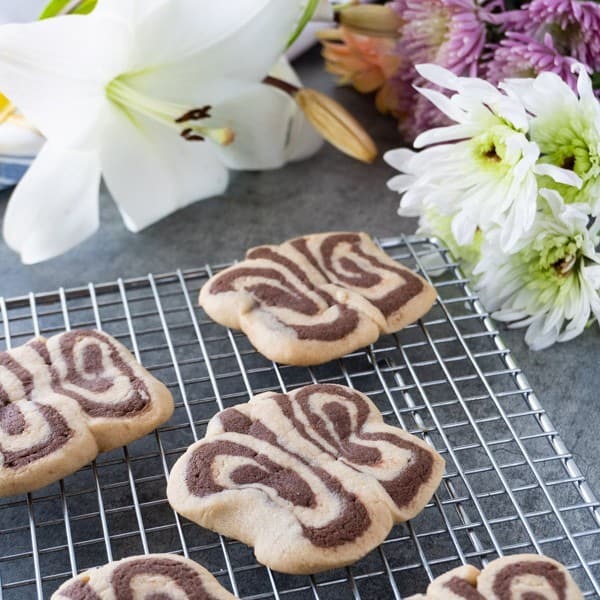 These butterfly cookies are a delicious spin on a classic sugar cookie recipe! I love these peanut butter chocolate cookies! They are so pretty and fun to make! Growing up I never really liked sugar cookies, but ironically, they are one of the cookies I make the most. Now that I’ve figured out a supremely delicious sugar cookie recipe I love making (and eating them!). I’ve shared my best sugar cookie recipe, my soft sugar cookies, and these delicious chocolate sugar cookies. Now I give you these peanut butterfly cookies – made using a variation on my classic recipe. Take me to the recipe for Butterfly Cookies already! If you don’t want to read my super helpful tips and tricks and get straight to this delicious Butterfly Cookies – you can simply scroll all the way to the bottom of this post for the full printable FREE recipe! Enjoy! The idea for these peanut butter cookies actually came from a good friend of my mine and my husband. Our friend has always enjoyed all my Hearthstone inspired recipes and requested I make a cookie for another fun Blizzard game called Overwatch. I’ve never played Overwatch but it looks super fun and our friend Nick really enjoys the game! Long story short, a character in Overwatch called Winston is a large gorilla who loves peanut butter but isn’t a huge fan of bananas. My friend also loved the idea of playing off the word peanut butter and so Peanut Butterfly Cookies were created. Even if you have no idea what Overwatch is have no fear- these cookies are delicious and great any time of the year! If you like bananas (unlike Winston) make sure to check out my Salted Caramel Banana Ice Cream! These Butterfly Cookies are too cute! 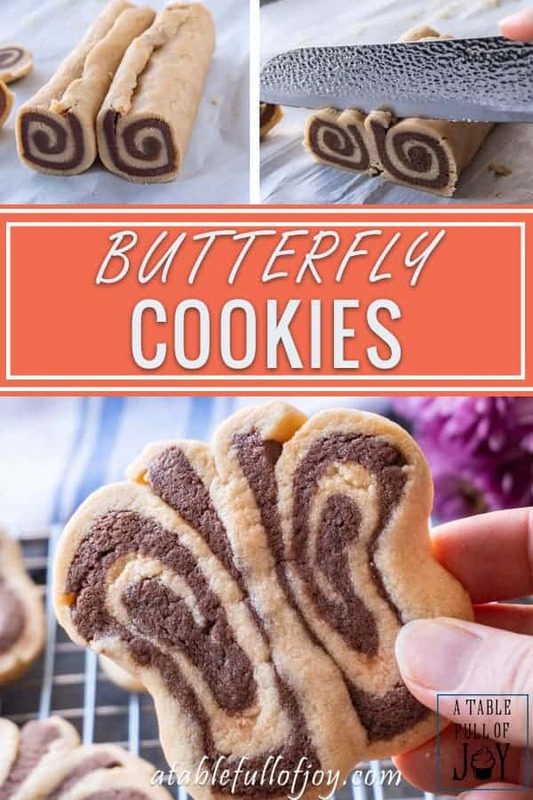 How to make Butterfly Cookies? Make the peanut butter cookie dough. Make the chocolate cookie dough. Roll each dough out into a rectangle and then refrigerate for at least 1.5 hrs (overnight is okay too). Trim the edges of the dough making the chocolate rectangle not quite as wide as the peanut butter rectangle. Stack the chocolate on top of the peanut butter making sure the bottom edges are matched up. 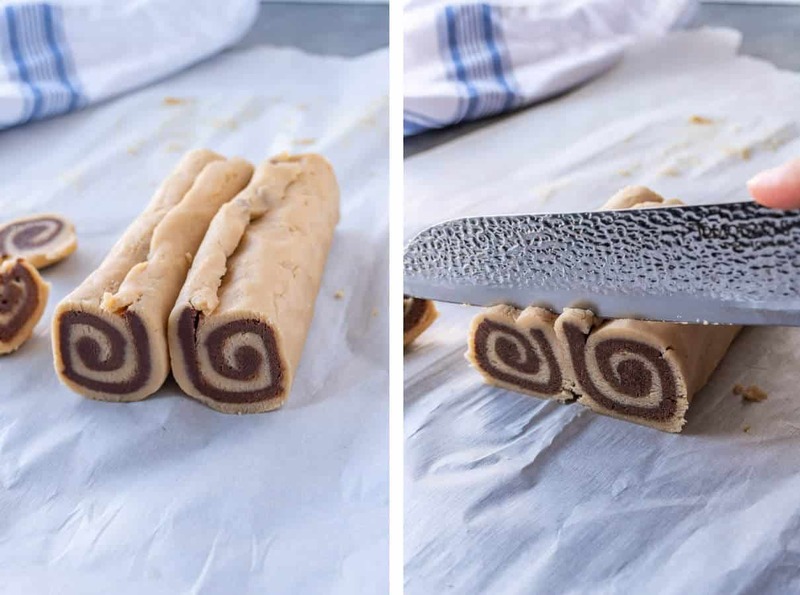 Roll the dough into a log, pinching and smoothing out any cracks that form as you roll them up. Trim the edges of the log, then cut it in half and gently press the halves together. 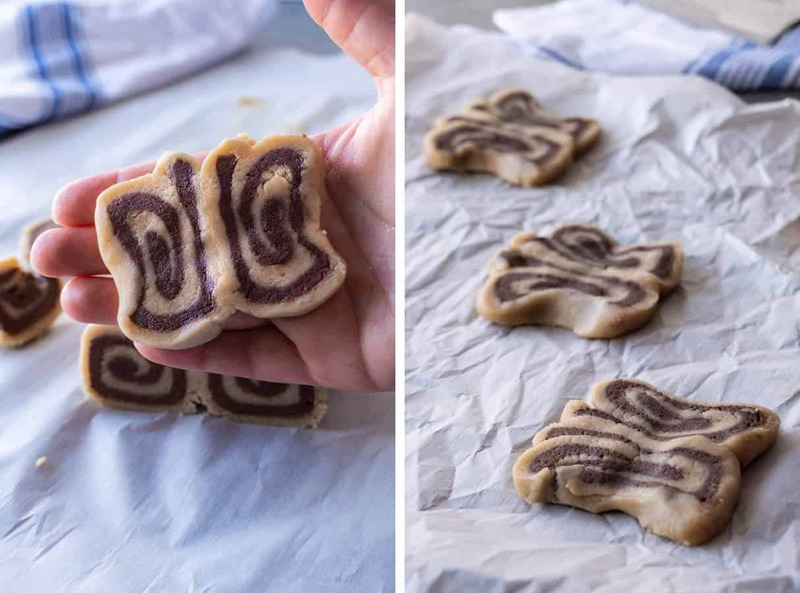 Cut the dough and then gently shape the cookie to look more like a butterfly. Place on a parchment lined baking sheet and bake for 18-20 minutes. Do I have to use a food processor to make these? I do recommend it – and I recommend this food processor. It is a work horse! Using a food processor allows you to combine cold butter into the dough which greatly improves the flavor and texture of sugar cookies! Can I frost these sugar cookies? Absolutely! I have instructions here for a sugar cookie icing and a chocolate ganache icing if you are interested. What is the best type of baking sheet to bake my sugar cookies on? Any will work but if you have a cookie sheet without any edges use that one. It will allow the air to circulate around the cookies better. 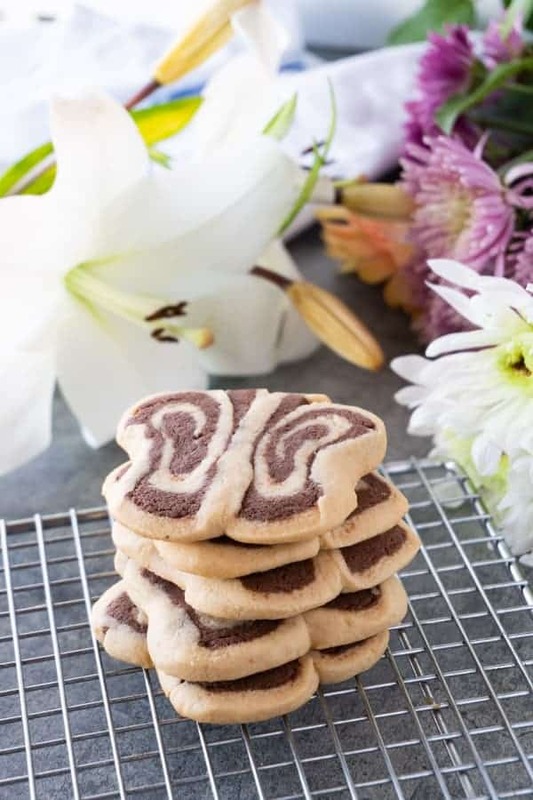 Whether you are making them for a game night or whipping these up as Mother’s Day Cookies- you can’t go wrong! This was a fun recipe to make and if you have any recipe requests let me know! If you like this recipe make sure to check out my delicious desserts like cinnamon toast crunch bars, grapefruit cupcakes, and my caramel pear pie! 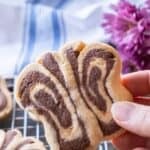 Butterfly Cookies -These tasty peanut butter and chocolate sugar cookies are fun to make and great for Spring! These butterfly cookies are a tasty spin on a classic sugar cookie recipe! Divide batter in half. Place half of the batter back into the food processor. Add in peanut butter, 1 ½ cups flour, 1/8 tsp baking soda and an 1/8 tsp baking powder. Process until combined. Remove dough from mixture, place on a piece of parchment paper and then place another piece of parchment paper over it. Roll out the peanut butter dough until you have the size of large rectangle. I like to roll it out in between the two pieces of parchment paper so the dough doesn’t stick to the rolling pin. Set aside. Place other half of dough into the food processor and add in the cocoa powder, espresso powder, if using, remaining 1 ½ cups flour, 1/8 tsp baking soda and 1/8 tsp baking powder. Process until well combined then remove from the processor and roll out the same as you did with the peanut butter dough. Refrigerate the flattened doughs for at least 1.5 hrs. Then remove dough from the refrigerator and preheat your oven to 300°F and line a baking sheet with parchment paper. Using a sharp knife, trim the dough to have straight edges and are roughly the same size. Mine were about 9 inches long by 7 inch high. You want the chocolate rectangle slightly smaller in height than the peanut butter so trim accordingly. Place the chocolate rectangle on top of the peanut butter rectangle making sure the bottoms match up. Since the chocolate dough is slightly shorter than the peanut butter dough, they won’t match up exactly (see picture in post above). Starting from the bottom roll the dough up to the unevenly matched top. Using the parchment paper to roll the dough will help. If the dough cracks as you roll it don’t worry. Just smooth and pinch it back together as you roll. Once it is rolled up completely cut the log in half and place each half side by side, slightly pinching them together (see picture in post above). Gently slice the rolled cookie dough halves and then gently press the dough together and pinch the middle to form more developed wings. Place cookies on parchment lined baking sheet. Refrigerate the rest of the dough while you aren't using it. Bake for 18-20 minutes, or until edges just start to turn golden. I recommend baking on the second to lowest rack in your oven. Depending on how thick you cut your cookies will alter how long you need to cook them (thicker cookies need more baking time, thinner need less). 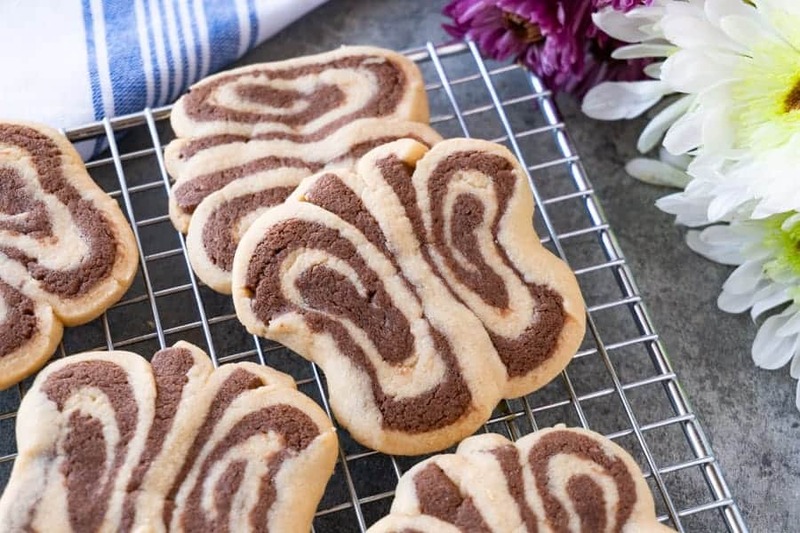 Use the cookie dough scraps to make marbled sugar cookies. Just mix the leftover dough together by hand and then form into balls. Smash flat and bake on a cookie sheet same as you did with the butterfly cookies. If you are wanting to frost the cookies you can find the icing recipe here!